This modern farmhouse encompasses so much of what many of us dream of, an open modern and luxurious space. This old historic structure that was salvaged from time, has been reclaimed to continue the stories for years to come. 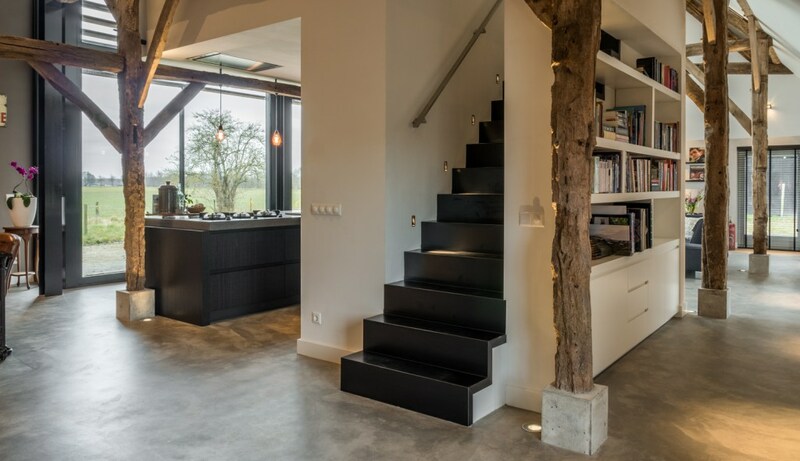 We love this renovation from Breda in The Netherlands. 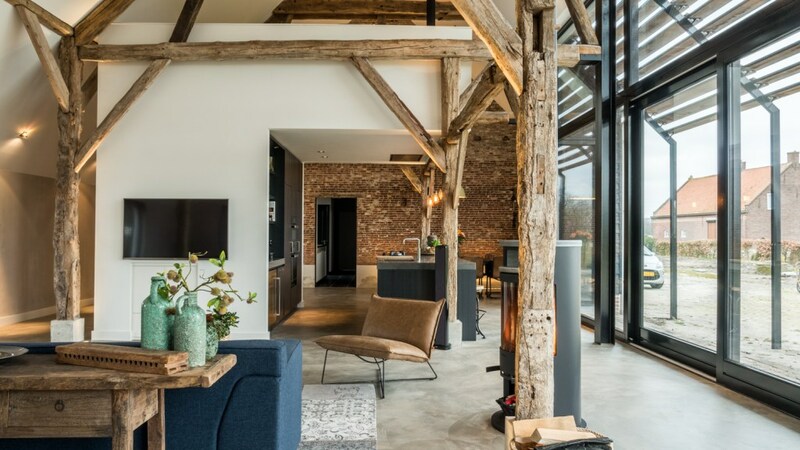 Conceived by Joep van Os, a local architect, the project sought to transform an old dilapidated farmhouse and attached barn. It takes vision and loving determination to take on this kind of project. The views of the surrounding landscape were key in opening up the home. Blessed with massive masonry interior walls and old wooden trusses this home just comes alive when all is cleaned up. The finished project featured a spacious living room, kitchen, bathroom, office and bedroom. Not enormous and stately, but truly a cozy place to call home. 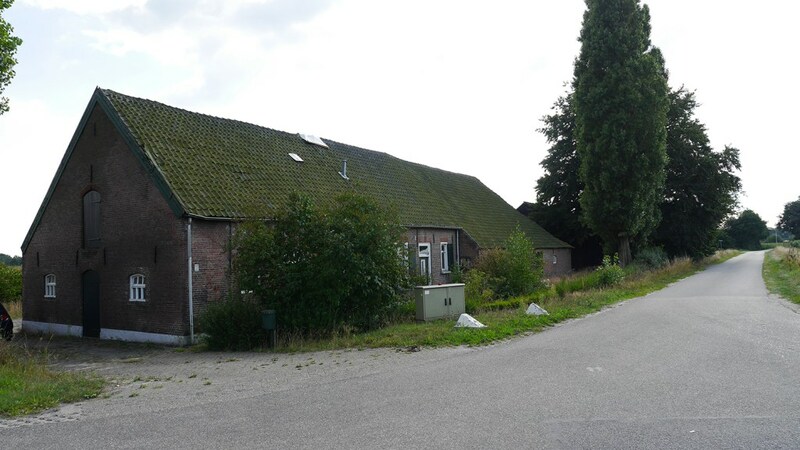 You can see from the images below how the long farmhouse is adjacent to the rural road. The true magic is in the back which faces out across an incredible vista of farmlands. When you see the state of the interior, you can understand the vision required to make this house come to life. 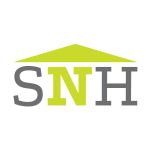 It’s proof that any structure, when met with innovation and great design, can be transformed and given new life. At the end of the day as this kind of transformation gives us inspiration to salvage and reclaim old structures. The existing building at the start construction. As you can see there is no open view of the surroundings beyond the far wall. 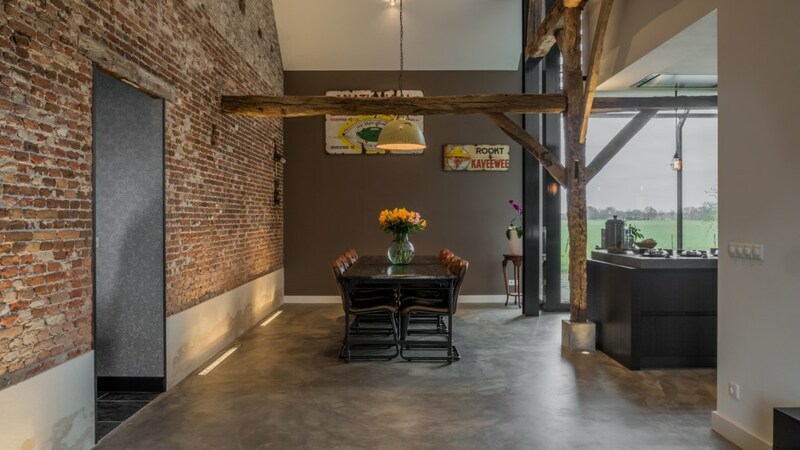 The architect elected to break through this wall and install tall wooden and glass doors to open up to the farmland vistas. 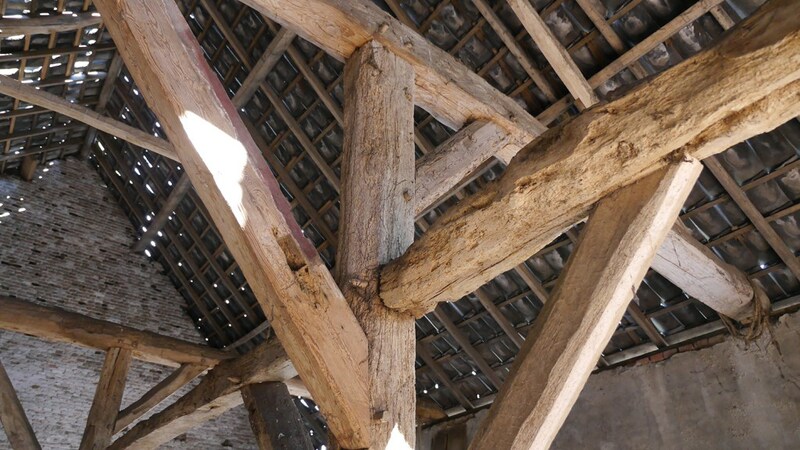 Detail of the old wooden truss structure. Looks can be deceiving when you first glance at old structural elements like this. But with the right reinforcement and architectural will often these can still be utilized for structure and beauty. The homeowners fell in love with the old farm details of the original structure, partly because of the attractive stonework and interior views of the surrounding area. 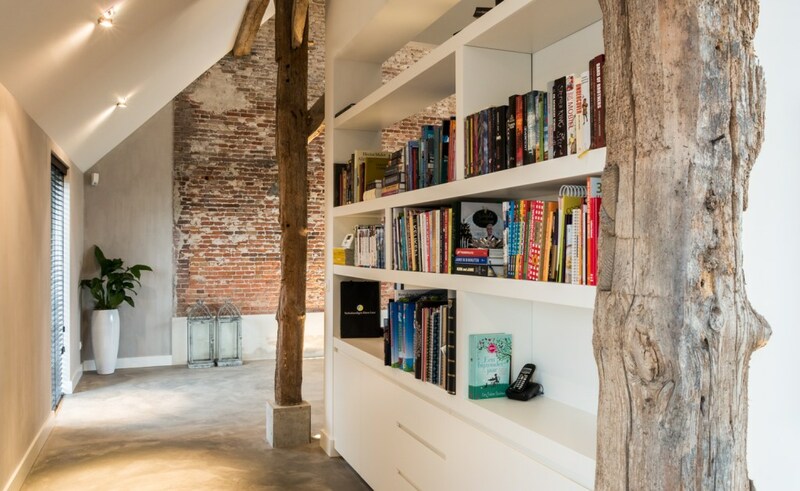 The old stable portion of the barn became a perfect location to form the open kitchen, bookcases, and a multifunctional space on top (which you see as the floating white cube element in the photos below). 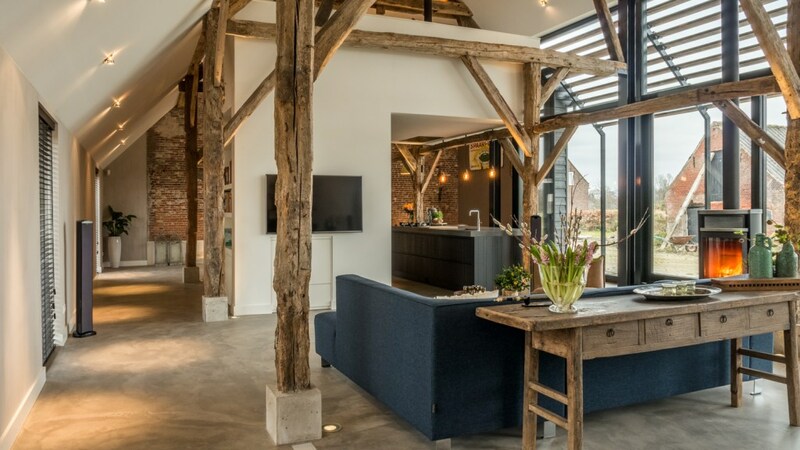 By compacting the kitchen and creating an open, multi functioning space, an expansive and dramatic living room, complete with the old wooden trusses was achieved. Vaulted spaces, all the way to the top of the roof make a small footprint feel expansive. 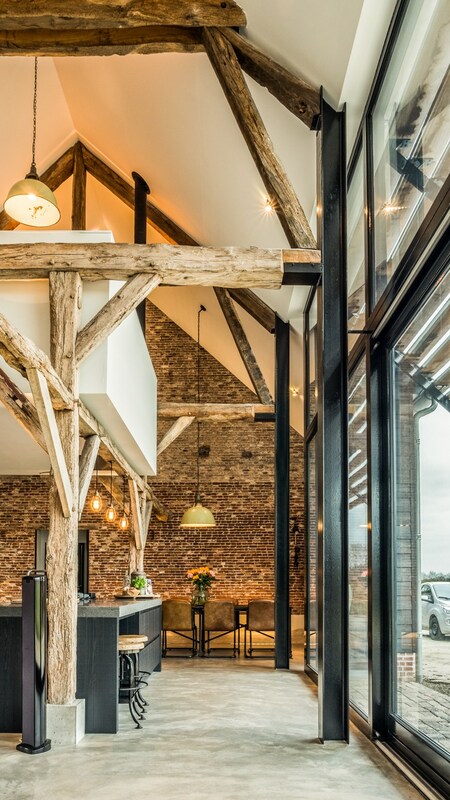 The architect took great care to ensure that all the beauty of the original wooden trusses and masonry walls were preserved and indeed showcased. You’ll notice that the new modern structure marries to the old. In the photo below, you’ll see the results of a long cut-out of the roof in the rear along with the new windows and solid wooden slat blinds that allow for plenty of light, air, atmosphere and views of the countryside beyond. With energy-efficiency in mind, the blinds do double duty as both a design element and a functional way to keep the summer heat out, while letting the winter heat inside. The slats fall exactly within the existing roof shape in order to preserve and honor that historic frame from the original structure. 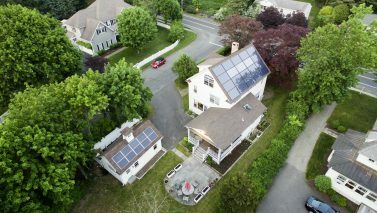 Throughout the house a new more energy-efficient structure was created to envelope the old historic elements. A new roof was constructed on top of the old wood trusses, this allowed for proper insulation and today’s energy efficiency standards.. To maintain the historic feel from the exterior however, the old roof tiles were meticulously removed and reused on the new roof. For the walls, an insulated layer was created along all exterior walls. 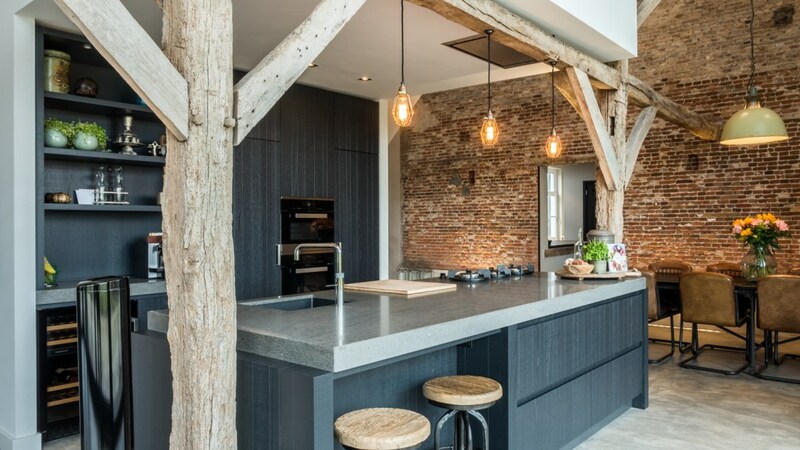 The exposed stone wall that you see in pictures below is an interior wall that served as a firewall between the old barn and farmhouse, now it is an elegant interior wall with all the charm that exposed stone provides. 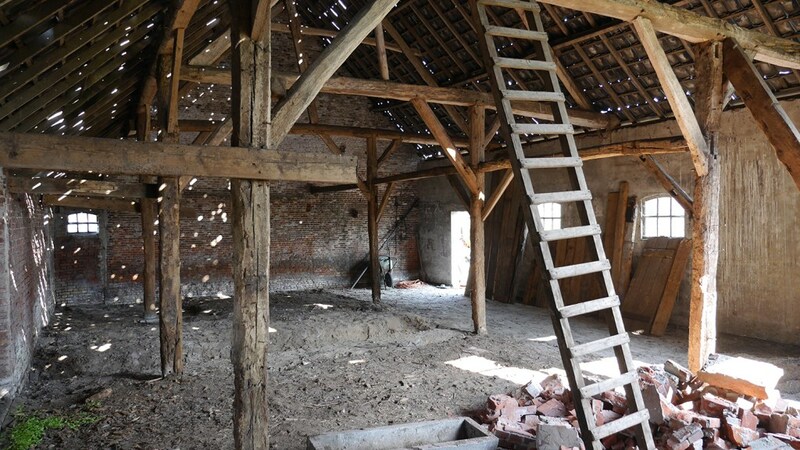 In this picture you can see how the white box structure above the kitchen is gently tucked into the old beams of the original barn creating a cozy place for the library and study. The inset white walls at the core are designed so that it perfectly sits within the original beam structure. A comfortable corner sectional sofa with a view of the kitchen, study, and those stunning exterior vistas. The back of the inner core structure that contains the kitchen house has built in bookcases and storage. A great use of this tight space between the living room and dining area. The cooking island fits between the original wooden truss structure. 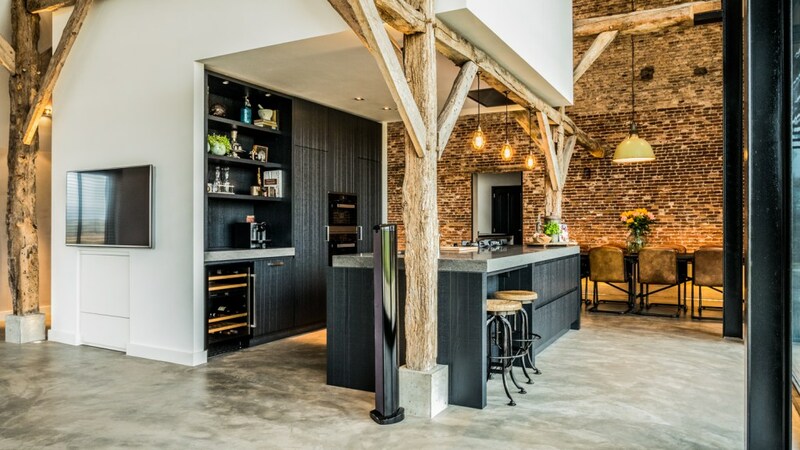 The wooden beams give extra atmosphere in the kitchen. The protruding part of the inner core structure with the study also relies on the horizontal wooden rafters. In this photo you can see where the concrete floors are extended up the wall slightly to meet the old brick walls.Throughout the house the newly poured floor and foundational reinforcement lend to the overall structural stability of the building. The cooking island with cupboards fitted between the wooden rafters. It’s a simple, yet stately place to prepare a meal and entertain. A comfortable dining area with large black table and chairs. 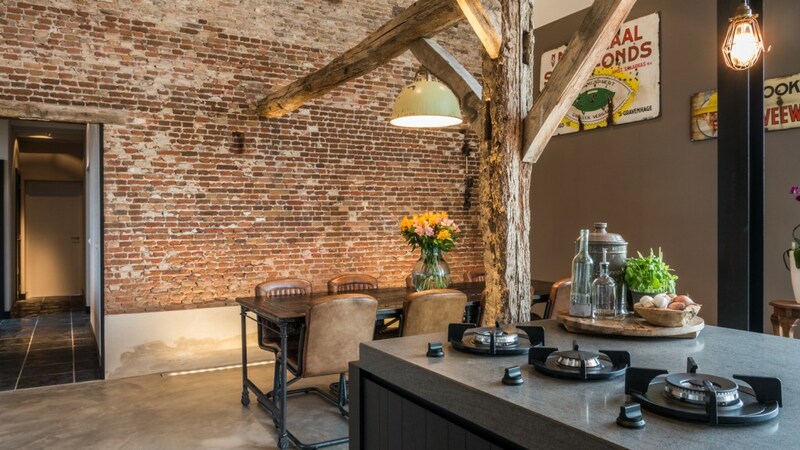 The wooden truss above the table connects with the old masonry. 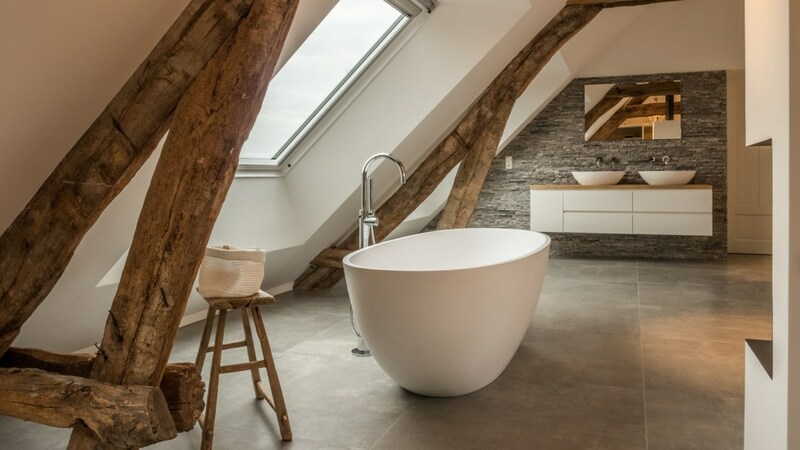 The detached Corian bath is positioned precisely between two of the old rafters with an integrated skylight in the roof to provide plenty of light to the bath area in the open Master Suite. From this vantage point you can see how a completely open master suite can work and it’s stunning. The gas fireplace is aligned with the increase in the floor height that accommodates plumbing. 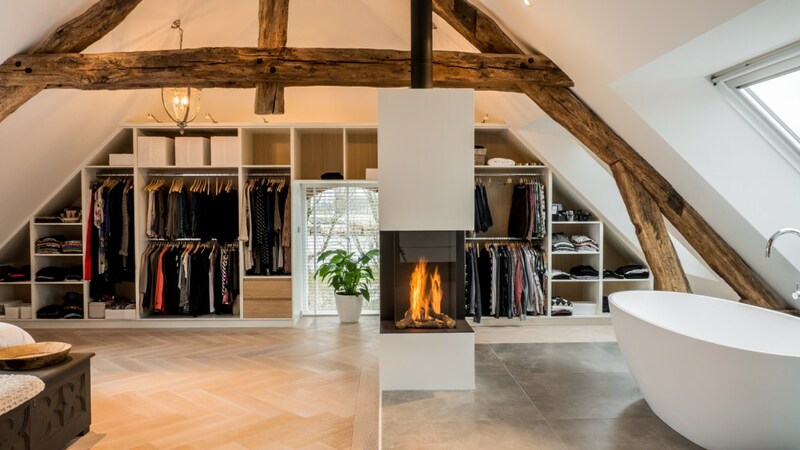 This forms a nice virtual separation for bedroom, closet and bathroom spaces in a very simple and elegant way. In this photo you can see more precisely the step up for the “wet” rooms that contain the tub, sink, and shower areas of the master suite. The increase was necessary to accommodate the beamed ceiling in the room below and still have space for the plumbing. 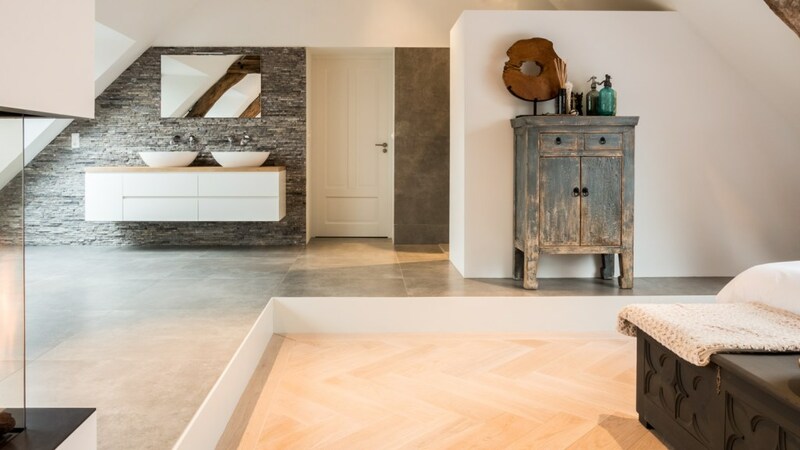 The different floor textures also add interest to this space with the tile in the “wet” areas of the room, and beautiful parquet flooring under the sleeping area. Thanks Joep for sharing this amazing project with us. 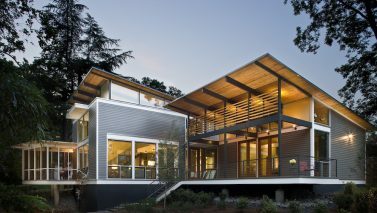 The unapologetic, side-by-side old and modern materials create a fabulous modern vernacular. It marries the modern world, both functionally and through the design.